Hello! My name is Eric Collins, I’m a graduate student from the University of Washington in Seattle, Washington, USA. I’m working with Dr. Jody Deming, studying the microbiology of Arctic sea ice. This is my second trip to the Canadian Arctic aboard the CCGS Amundsen. My first trip was in the winter, too–how lucky am I!? Over 70% of the Earth is covered by seawater, and sea ice comes from seawater, so we’ll start there. If you take a tablespoon of seawater from anywhere in the world’s oceans and look at it under the microscope, you’ll find about one million bacteria there–even in the Arctic, where the water temperature right now is about -2 degrees Celsius/+28 degrees Fahrenheit. If you look even closer, you’ll find about 10 million viruses in that same water. This shouldn’t inspire fear, in fact quite the opposite: bacteria and viruses are completely natural and provide invaluable services to higher levels in the ocean’s food web, for example by degrading wastes and recyling nutrients for use by primary producers (mostly diatoms in the Arctic, these plant-like microorganisms use sunlight and various nutrients dissolved in the water to grow). As it turns out, these biological processes also take place inside the ice sheets that covers much of the polar regions (and about 7% of the Earth) during most of the year, but much less is known about the ice than the seawater. Especially little is known about the microbiology of sea ice during the winter. Today I’m going on the ice with a small group of researchers interested in the biology and chemistry of the sea ice (don’t worry Mom, as always we’re with an experienced observer of polar bears!). The sun never rises above the horizon but we have a couple hours of twilight to get our work done. We use an ice corer to drill into the ice and collect enough pieces to do our analyses. Today the ice is about 60 centimeters/24 inches thick, which is pretty normal for this area at this time of year. From the first core we measure the temperature in the ice and find a gradient from -14 C/+7 F at the top (near the air) to -2 C/+28 F at the bottom (near the seawater). This is also normal because the air is much colder than the seawater (the air temperature has remained fairly steady at about -20C/-4 F for the last few weeks). The reason the surface of the ice isn’t as cold as the air is because there is a thin layer of snow on top of the ice (about 3cm/1in). Snow is a great insulator–that’s why snow caves and igloos are such useful shelters when the weather is cold. Luckily we have the floating Hotel Amundsen nearby to keep us warm and well fed so we don’t have to sleep out on the ice. (Later in the CFL mission some researchers will in fact be sleeping out on the ice in insulated huts, but that’s not until sometime next year). In Arctic waters, microbes (living things you need a microscope to see, like bacteria, archaea, viruses, diatoms, ciliates, etc.) 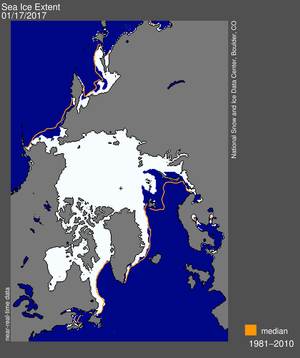 from seawater get trapped in the growing sea ice, starting in the autumn and continuing throughout the winter. As the seawater freezes, sea salts and other impurities get rejected from the growing ice crystals and concentrated into pockets within the ice. Because the water in these pockets (called brine) is very salty (up to 7 times as salty as seawater!) it remains unfrozen even at very low temperatures, and most of the microbes have been observed to reside inside these ‘brine channels’. One mystery that we’ve been studying in our group is how bacteria manage to survive the sub-freezing temperatures and extremely salty water, because we know that many of them do survive. Nature was clever enough for adaptations like blubber and fur coats to evolve, and humans were smart enough to take advantage of these inventions and invent of few of their own as well (like igloos and sleds), but what about the bacteria? Obviously they don’t have brains and can’t grow furry coats, so what kind of adaptations have they evolved to survive in these extreme conditions? Out on the ice I collect a core and cut it into sections with a sterilized Japanese pruning saw. For deeper holes I use the (as-yet unpatented) Collins Core Extraction Device (aka ‘the ice grabber’ aka ‘the mason jar lifter‘) to pull the core out of the hole. We constantly have to invent new tricks and techniques to get our work done, for the simple reason that at temperatures of -20C and below nothing works like it is supposed to—or at least that’s the way it seems! Tape doesn’t stick, plastic shatters, batteries die, a little moisture freezes two metal parts together that should not be frozen together, your fingers freeze, your toes freeze, even your snot freezes (and of course there’s a name for this phenomenon: snotsicles). After I finish cutting the ice sections and placing them into sterile bags to take back to the ship with me, I use a Niskin bottle to collect some seawater from just below the ice sheet, so that I can compare the ice to the seawater, from which the ice originated. Back in the lab (after warming up with a mug of hot chocolate and perhaps a little snack…) I’ll crush the ice, melt it, and collect samples of the melt water for a set of microbiological and chemical analyses. [Snack time!] We’ve learned a few secrets for surviving in the cold by studying bacteria in the laboratory. For example, we know that cold-adapted microbes can change the types of fat molecules in their cell walls to keep their membranes from solidifying. They can produce chemicals called ‘compatible solutes‘ that counteract the effects of salt. They have evolved to use amino acids differently in their proteins so that they work better at low temperature. They produce a sticky sugary gel called EPS (extracellular polymeric substances), to surround themselves with a soft cushion that protects them from being squished or poked by growing ice crystals. All of these things are ‘built-in’ so to speak–the microbes arrive in the ice with a genetic toolbox for dealing with all of these stresses. But what if those tools are not good enough? And where did they get those tools anyway? (You can be sure they didn’t buy them at the local hardware store). After the ice has melted I’ll do several things with the meltwater, and the seawater. First, I’ll take a small amount and preserve the cells with formaldehyde. That kills them so that they don’t reproduce but it also preserves their shape so that later I can count them under the microscope. Next I’ll filter the water through a variety of different types of filters (which I’ll take home to Seattle), so that later I can measure different properties of the ice and water. For example, I will filter the water onto glass fiber filters to measure chlorophyll (as a proxy for the primary producers I mentioned earlier), particulate organic carbon and particulate organic nitrogen (which contain nutrients that could be made available to the microbes), and suspended particulate matter (like grains of sediments that are prime microbial real estate, and can tell us about where the seawater originally came from). Next I’ll filter some water to collect EPS, the gel that I mentioned earlier. Finally I’ll pass water through the smallest filter, which collects all the bacteria so that the diversity of the community can be analyzed by DNA sequencing, for example. I’ll also collect the water that passes through the final filter, and from that I’ll be able to count the number of viruses and measure the amount of DNA dissolved in the water. There are a number of ways for microbes to acquire new tools for dealing with stressful situations. One way is for small random mutations to accumulate in the microbe’s genome over thousands or millions of years, each potentially providing a small but significant advantage to the microbe under some set of conditions. This is like building a new tool from scratch: you try it one way, change it a bit, then try it another way, slowly perfecting it with each version. This is probably how the ‘membrane-lipids’ and ‘amino-acid usage’ tools came about. Another way to get a new tool is to borrow it from your neighbor, which is called ‘lateral gene transfer‘ when it happens in the microbial world. For example, viruses can sometimes malfunction and transfer DNA (the blueprint for life) from one microbe to another; this is called ‘transduction‘. Another method of lateral gene transfer, ‘transformation‘, happens when a microbe takes up DNA dissolved in the water and incorporates that DNA into its own genome. If any of that transferred DNA contains useful genes, like those coding for the production of a compatible solute, then it could prove advantageous for the recipient. Eventually that cell could outcompete its siblings and take over, or invade a new niche. By measuring the abundance of viruses and dissolved DNA in the ice I can begin to better understand how Arctic microbes have adapted to the extreme environments they are faced with each day— at least at the beginning of this century. The amount of summer sea ice has been dwindling for the past few decades, but in recent years this trend has accelerated. We know so little about Arctic microbiological communities that we really can’t predict how they will react to a warming climate, but I have no doubt that eventually they will adapt, somehow. The real question on my mind is: how will we? It’s dark when I walk back to the ship after another successful day on the ice. The stars are shining and there is the faintest whisper of the Aurora Borealis, the northern lights that occasionally blanket the sky with a shimmering diaphanous glow. I look up and spot a bright star…. no, wait… that’s Mars! I think about the fact that the surface of Mars is cold, too, far colder than the Arctic was today. But then, so are most places in our solar system: ice is the natural state of water in the vast majority of our vast universe. I meander ahead, still staring up at the sky. The snow squeaks under my boots. I imagine myself as an astronaut, exploring an icy planet far from Earth, searching for life and knowing that if it exists it probably lives somewhere in the glittering ice beneath my feet.